Have I ever told you how much I love my Keurig? I really really do! Even hubby who was never a coffee drinker is getting some use out of it. It’s FuN! Just received a very exciting package in the mail last week. 30 K-Cups for the next 30 days of my morning coffee. The most FuN thing about it is I can receive a box just like this every.single.month. Mixkups is a web store that I was de-Lighted to find! They have two awesome options for their customers. K-Cup of the Month Club. 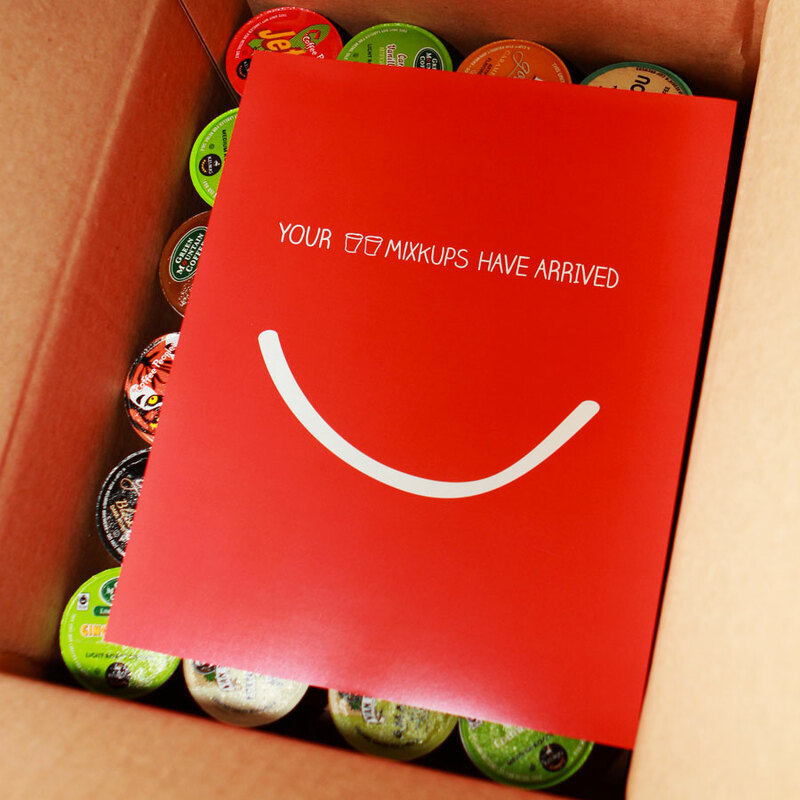 Each month you will automatically receive a SURPRISE package in the mail. It will contain a variety of 30 K-cups. Each month different! 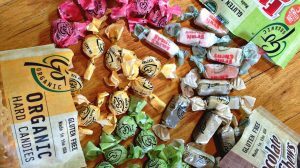 Seasonal flavors, new flavors, even the ole standbys you’ve come to depend on. You’ll get them all! Sign up for one month, twelve, or anything in between! I think it would also make a great gift! $32 which includes shipping. Pick Your Pack. Select ANY K-Cup ~ in ANY quantity ~ and have it shipped to you! If you buy 32 or more then there is free shipping! Combine them and do something different every month if you want! plus I got some Green Tea and Hot Chocolate for the boys. YUM! It will be FuN deciding what I want to drink each morning. 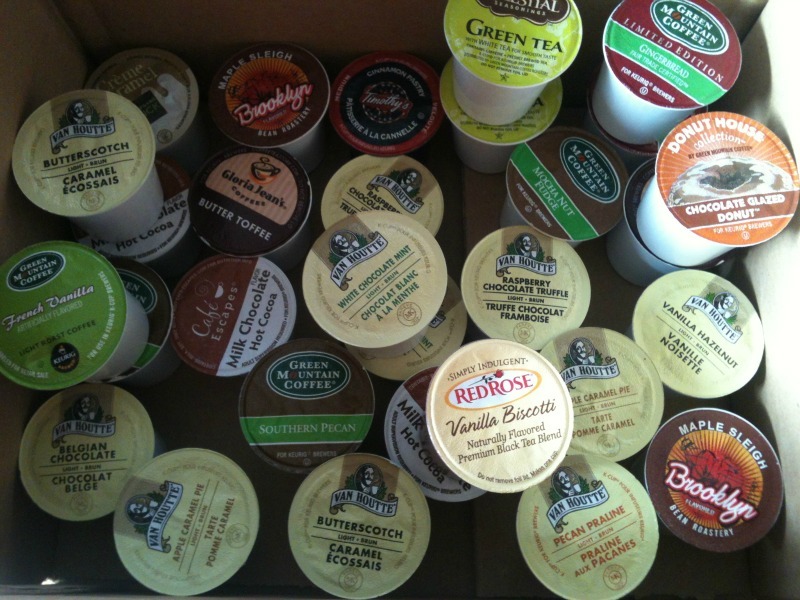 What is your favorite K-Cup flavor? WIN a Pick Your Pack from Mixkups! ~ 30 K-Cups of your choice! Very cool - there are always kcups I'd like to try, but don't want to be stuck with a whole box if I don't like them. I'd love to try the Chai Latte! I love Chai Latte and Sleepytime Tea. i havent found my favorite flavor yet... but like just a bout anything! My mom mixes Vanilla Caramel with Hot Chocolate. I usually drink the second half of her cup when I'm over there. Green Mountain Breakfast Blend is my favorite so far. My favorite flavor is Timothy's Breakfast Blend but I'd sure like to try some of the others. Like Butter Toffee or Caramel Vanilla Cream, so many good ones to choose from! I really like the Dark Magic and I am hooked on the Sleepytime Tea K-Cup!!! I love the seasonal flavors like Eggnog. I love my Keurig and I love so many different flavors of coffee's and tea's. Especially the holiday flavors. Thank you! I really like Cafe Mocha. Wow, they have a lot to choose from! My favorites are the dark roasts and the chocolates. My favorite is hot cocca. Chai Latté is my favorite K-Cup. My husband and I have been drinking a lot of the hot chocolate or hot apple cider at night. It's really a nice treat on these much colder evenings. A fleece blanket, roaring fire, good movie and our hot chocolate makes for a great evening. I would love to try a mixture of K-cups. My husband is the coffee drinker in this household, but I prefer different tea flavors and hot chocolate. Winning this giveaway would be awesome! I like Regular Hazelnut K-Cups! I would love to get Apple Caramel Pie!! I like the Cafe Escapes Milk Chocolate Hot Cocoa. Love that you can build your own variety pack. I would love to try the Caramel Apple Pie and the Cinnamon Pastry! Yummmmm. I drink coffee and my husband likes tea and hot chocolate so this would be nice to win. This may seriously be my FAVORITE giveaway of yours EVER. I love my Keurig and I love trying new ones - I really am going to try this out! LOVEEEE! Anyways - right now I'm loving Coconut Mocha from Donut House. I love starbucks french roast! Golden French Toast is my absolute favorite. This is an awesome giveaway-THE BEST EVER!!! Thanks for the opportunity. I love French Toast by Green Mountain. Talk about yum!!! I love Gloria Jean's Butter Toffee coffee. I love the Green Mountain Pumpkin Spice, we had that at my office this fall! I bought a saple pack of mocha coconut at target. I heart it!! The Green Mountain Pumpkin Spice is one of my fav's!! I like anything Hazelnut or Vanilla. My favorite is Green Mountain Dark Magic Coffee. I love chai latte k cups. I just bought my Keurig, so I would love this! Thanks for a wonderful giveaway! I think I would love the Jet Fuel Extra Bold. I love the strong ones. The Vanilla Biscotti looks tasty as does the White Chocolate Mint. Green Mountain Nantucket is my favorite plain K Cup and Gloria Jean's butter toffee is my fave flavored. I have not tried all of their flavors yet so I don't have a favorite yet. Thank you for the delicious giveaway. I love the Milk Hot Chocolate! I love SOuthern Sweet tea! I like the Wild Blue Berry coffee. I don't have any one favorite but I do like Cafe Escapes Chai and donut shoppe coffee. Green Mtn Coffee Breakfast Blend is my favorite. I love this idea! My daughter in law has a Kuerig and I so want to be able to give this to her. It would be just fabulous for her! MMM I love my coffee!!! I also love to try new flavors!! I love Green Mountain Coffee's Breakfast Blend! I like Double Black Diamond by Green Mtn Thanks!! I love the Donut House ones. All so delish. Unfortunately my daughter loves them too. I like the green mountain coffee. Wild mountain blueberry I like! I love the island coconut k-cups but they're so hard to find!! I PRETTY MUCH LOVE MOST FLAVORS BUT MY FAVORITE WOULD BE ANY OF THE BREAKFAST BLENDS-THANKS! The cafe escapes hot chocolate! Oh boy. I just got a Keurig for christmas and I've gone a little over the edge. I keep telling everyone that I love the idea of someone sending different samples every month. I am one of those people who likes to try something different every day. No joke. This is a great giveaway, and thank you for spotlighting them, because I didn't know they existed! :) As for favorites, hard to pick, but I love just about every kind of Caribou Coffee blend. Also Newman's Own coffee is awesome. My favorite, and what I usually purchase, is the Starbucks Pike Place Medium Roast, but I do enjoy the variety that they offer. mmmm vanilla caramel latte my hubby and i would enjoy this! I actually like the tea k-cups best! I like the Mahogany Caribou Coffee! I love anything that has caramel in it! I love the French Vanilla ones :). I like anything French Vanilla. I don't have a favorite because I've never used one. BUT, we are planning on buying a Keurig in the next couple months. I hope I didn't mess up. I swear I just entered, walked away from the computer, and when I came back I had 0 entries. So I re-entered. Sorry if it's a duplicate. I love anything with chocolate!! Love The Original Donut Shop kcup! Brooklyn Bean Breakfast Blend Decaf for my hubbie! I have only tried K-cups at my sisters house. I like the hot chocolate! I have a lot of favorites...Hazelnut is one of them and Cherry Swirl is another. I'd try the hot chocolate. the salted caramel hot cocoa sounds good on a cold day like today. thanks for another great Canadian-friendly giveaway. I would like anything caramel! I have honestly never had a k-cup. But the southern pecan sounds pretty darned good! I like the hot apple cider K-cups! DELICIOUS! I love the Green Mountain Caramel Vanilla Cream Thanks for the super awesome giveaway! I'm not too picky, I've enjoyed most of the k-cups I've tried! I like Doughnut Shop or Columbian coffee. Thanks! I love Green Mountain Wild Blueberry. My favorite K-Cup flavor is Folgers Caramel Drizzle. My husband loves anything vanilla and I just love all of the tea K cups. My favorite is Van Houtte French Vanilla! My favorite K-cup is the Green Mountain Caramel Vanilla Cream..Yum!! we usually drink starbucks coffee here but alot of the flavors sound great.